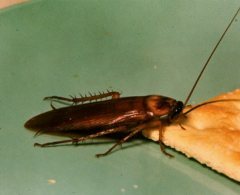 American Roach on Cracker YUK! Legs Up Roach Cobra Exterminating Cordele Ga.
Cobra Exterminating brings a higher level of professionalism to the Middle and South Georgia pest control industry. We set a new standard in safe, effective products, application techniques, and the experience to deal with every possible pest problem. It’s our people, products and service that create better results. And we guarantee your satisfaction with those results. It’s not just our job, it’s our commitment. 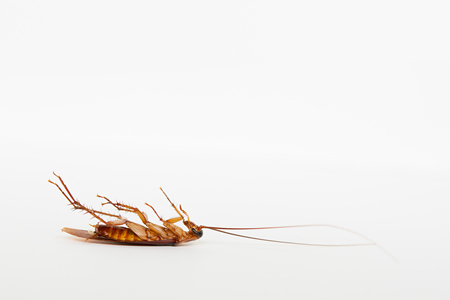 We are always sensitive to environmental issues, so we take a more thoughtful approach to pest control in the our part of the country, which includes: Cordele, Albany GA, and the Tifton area. We believe in using fewer chemicals, but using them more effectively. We also spend more time inspecting and monitoring, so that pesticides are only applied where the pests are. It is for this reason that we are proud to offer our Legs Up IPM pest service. When you need special information relating to pest control in Cordele, or Integrated Pest Management (IPM) programs, Cobra Exterminating has your solutions. We provide the most comprehensive and current technical information to help identify pest problems such as bed bugs in Georgia and design solutions for you. 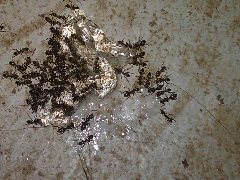 One area of Cobra Exterminating that is becoming more and more important and popular is the Quality Assurance Program under the leadership of Carl Brown specializing in Urban Pest Management, and IPM techniques. Please feel free to call 229.322.2504 FREE or e-mail info@cobraext.com if you have any questions or concerns regarding our Legs Up pest control service. If you have more questions about our Middle Georgia pest control services, Albany GA Pest Control, or concerns about termites in Cordele Georgia, feel free to contact us today.